The Ireland skipper picked up the Western Conference trophy despite defeat in Seattle last night. 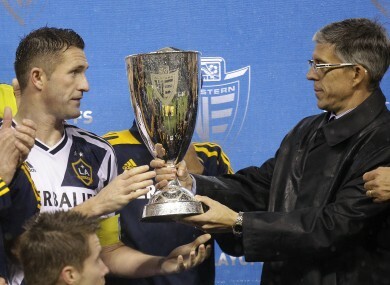 Los Angeles Galaxy captain Robbie Keane, left, is given the MLS Western Conference championship cup. IN-FORM IRELAND STRIKER Robbie Keane was on the mark again as he got his hands on some silverware last night. The Dubliner led the LA Galaxy to the Western Conference title despite a 2-1 away defeat to the Seattle Sounders. The defending champions advanced to the final of the MLS Cup Playoffs thanks to a 4-2 aggregate. Earlier, Houston Dynamo set up a rematch with LA in the decider after they prevailed in their semi-final. Houston managed a 1-1 draw away to DC United in the second leg of their tie on Sunday, enough for a 4-2 aggregate win and a place in the season decider on December 1. LA and Houston met in the final of the 2011 MLS Cup, when Landon Donovan’s goal saw Galaxy win 1-0 and record their third championship victory in the competition’s history. Houston earned a shot at avenging that defeat thanks to Oscar Boniek Garcia’s 33rd-minute strike at RFK Stadium. Branko Boskovic got one back for DC with seven minutes remaining, but it arrived too late for the home side to mount a fight-back. Later, goals from Eddie Johnson and Zach Scott saw the Sounders take a 2-0 lead at home to the Galaxy, and close to within one goal of levelling their series. But Keane struck on 68 minutes from the spot to restore LA’s two-goal cushion, and the Sounders proved unable to force a way back into the contest. Their challenge ended on a sour note when Osvaldo Alonso was sent off five minutes into time added on. Email “Robbie Keane on the spot to help Galaxy to MLS Cup decider”. Feedback on “Robbie Keane on the spot to help Galaxy to MLS Cup decider”.